500 years of revival history beautifully displayed at a glance. Study with ease to understand the big picture of God moving in our world. 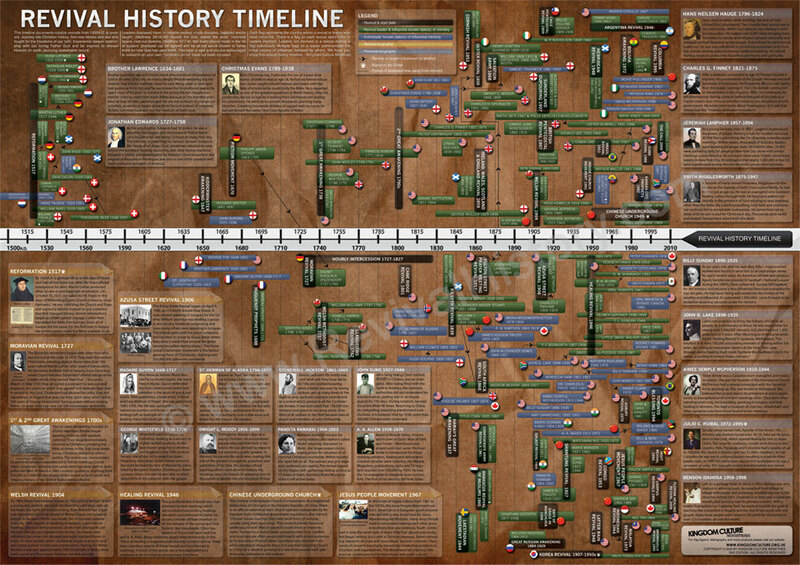 If a picture is worth a thousand words, this Revival History Timeline is worth a million! 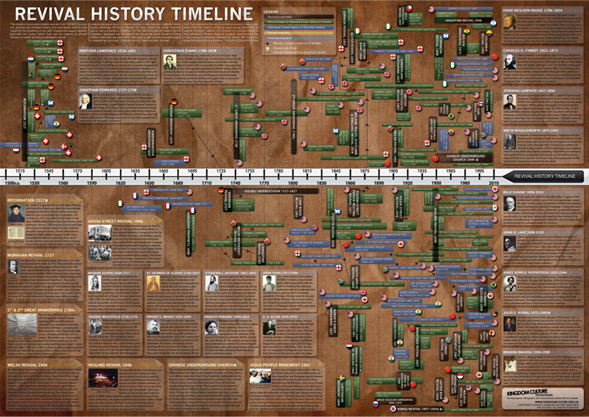 The timeline takes you in to a 500 year story that draws you in with interest time after time. You’ll see pictures and read stories that will encourage your faith as you look through the timeline. Details once available to those with countless hours to read rarely found books are now laid out in a beautiful, simple to understand way. Give yourself, children and grandchildren the knowledge of revival history worldwide since 1500A.D. Buy for yourself, your church, school, family, friends or even your pastor. Included on the revival history timeline are many world changers such as Billy Sunday, John G. Lake, Smith Wigglesworth, Jonathan Edwards, Kathryn Khulman, Oral Roberts, A. A. Allen, William Tyndale, John Calvin, Dwight L. Moody, Billy Graham, Aimee Semple McPherson, Charles Finney, Madame Guyon, William Seymour, Brother Lawrence and nearly 150 more! See how they fit in to the bigger picture of history! Shipping of your Revival History Timeline occurs within 3-5 business days. Your order will come rolled up neatly in a postal tube. Orders are shipped via Royal Mail with care and prayer from England. International packages can be expected to arrive generally within 2 full weeks, or up to 4 full weeks during busy seasons or with customs delays. “…It gives an understanding of the ever accelerating purposes of God and stirs our faith to lay hold of the Father’s awesome plans for our own generation.